In the last decade, we have seen considerable changes in software development specific to wholesalers software. An integrated suite of business functions designed specifically for the small to medium wholesaler and available as you want it – a secure, stable ‘on premise’ solution or a solution delivered via the cloud. More realistically perhaps, a combination with a full suite of business applications using a common database where critical business data is held securely on your premises but is also backed up to dual redundant data centres. Perhaps the opposite, with your own, dedicated server hosted in a secure data centre and business data backed up to your own or to a third party site. Either solution should also be available with financing options to satisfy expenditure rules. Within this blog, we will discuss the impact on the wholesalers software market caused by the major paradigm shifts. These include the internet, a common desktop platform and the advent of an integrated suite of software functions that support the wholesalers software requirements and businesses. There are however, other factors that directly influence this market and contribute towards its future vision and growth. One of the most powerful of these comprises the people who have helped to create the wholesalers software market. Hence this section is in the form of a biography of possibly the most prevalent and vocal of the industry luminaries. Mike Munnelly is the most influential personality who has shaped and created the wholesalers software marketplace. 1955 – Joined Kalamazoo in the market research department but almost immediately identified that the exciting roles were in sales and marketing and ultimately made a move to work under the direction of the sales manager Oliver Bolland where he thrived, grew and learnt his craft focusing on wholesale distributors in the West Midlands area. Kalamazoo recorded that Mike had the highest IQ that they had ever tested after completing his induction period. 1965 – Mike approached by Singer Business Machines – a part of the Singer Corporation who at the time were the 29th largest company in the world – to become the new Major Accounts Manager to work a specific territory in the east midlands. He swiftly rose to become Branch Manager for the West Midlands closely followed by assuming control of their London, Bristol and Manchester regions. In 1975 he became Sales & Marketing Director. In the UK, Singer Business Machines thrived but in other territories it did not. During this time Mike was asked if he would assume control of the US operation, which he declined for this very reason. Singer Business Machines was ultimately then sold to ICL. 1975 – Never one to sit still for too long Mike then moved to become the MD for an organisation called BCL who, under Mike’s stewardship, grew from losing £40K per month to a £12M IPO four years later. 1980 – He set up Xavier Computer Systems in Berkhamsted with a focus on the early PC market, working with Xerox and a number of Californian based manufacturers with early UNIX systems thriving through these testing and tumultuous times with a focus on providing point hardware and software solutions to the wholesale market. Again under Mike’s council Xavier grew rapidly before being sold to a private business group owned by Kerry Packer. 1988 – Mike approached by Bill Grogan to come out of retirement to start Ramdis Computer Systems with a pure focus on re-developing the software market for wholesalers. 2000 – Because of his past experience and expertise in developing hardware and software solutions for the wholesaler’s market Mike was approached by the owners of Intact Ireland to develop the UK market. 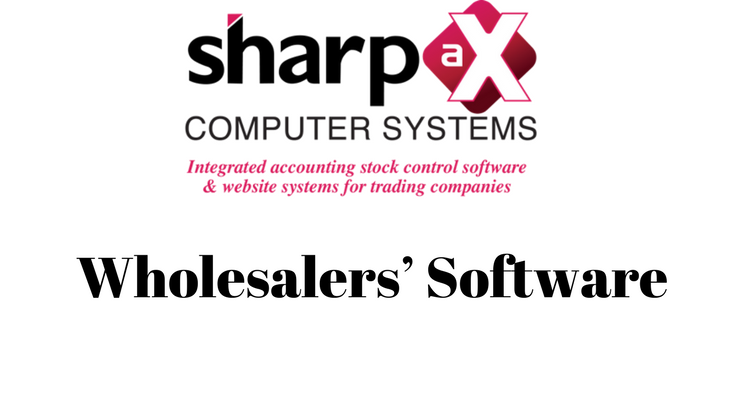 2000-2015 – Mike develops the new Sharp-aX solution from his understanding of the wholesale software market and its specific requirements. Mike had identified that almost all existing solutions were point solutions only and as such did not necessarily solve the problem of data silos (as discussed previously). Mike’s answer was to develop a software only solution that integrated all of the major business functions (BI, Reporting, CRM, Accounts/Finance, Stock, Warehouse Management with integrated Web shop-front and Catalogue content management). The rationale behind this development being that all functions drive data in real time down to one common secure data base. In this way, all data that exists in the solution is searchable and retrievable but most importantly is accessed in real time and constitutes a single source of the truth. This approach removes the errors cause by data duplication and introduces strong business efficiencies to the organisation and delivers the ‘Wholesale Software Business-in-a-box’. The result is an affordable solution designed specifically for the wholesalers’ market and optimised to provide real business benefit (reduced cost and increased revenue and margin) for the small to medium wholesale business. 2016 – Mike separates the Intact operation from Sharp-aX in order to devote his energy on developing the market further. It should be noted that Mike currently commands the only software organisation who have released completely new solutions technology for the wholesale software market this century. We shall explore these together and I predict a positive outcome and a bright, sharply focused future as these elements combine to inform and educate us in developing vision and strategy that will underpin our future growth together. Influencing purchasing decisions should far outweigh seeing wholesalers software being viewed solely through the prism of cost. The word ‘wholesaler’ is derived from the word “Wholesale” that means selling goods in large quantity or in bulk. According to S.E. Thomas “A wholesaler is a trader who purchases goods in large quantities from manufacturers and resells them to retailers in small quantities”. The wholesaler is therefore neither manufacturer nor retailer but acts as a link between the two parties. Assembling – The wholesaler buys good from different manufacturers producing the same streak of goods. They assemble them in their warehouse for the purpose of sale to the retailers. Storage – A wholesaler stores the goods in their warehouse. They will make them available in appropriate and requisite quantities as and when they are required by retailers. Grading and Packing – A wholesaler sorts out the goods according to their quality, size, shape, content etc. and then packs them carefully to sell them to the retailers. Transplantation – Wholesaler buys goods in bulk from the producers and transports them to their warehouse. The wholesaler also provides the facility of transportation to the retailer which is one of the important functions of wholesale trading. Financing – This is an important function of the wholesaler. A wholesaler usually buys goods on cash from the producers and sells on credit to the retailer. In this way they provide financing facilities to the retailer. Risk bearing – The wholesaler bears all the trade and financial risks of the business. Since they buy goods in bulk for making them available to retailers in small quantities, the wholesaler takes all the risk involved in marketing of goods. He not only assumes the risk of loss arising from an unexpected fall in the prices of goods but also the risks of damage, deterioration in quality, spoilage etc. in the warehouse. Market Information – One of the most important functions of wholesaling is that it provides important market information to the retailer and manufacturer which help the retailers with regards to the demands of consumer and manufacturer so that they produce the goods according to the changes in the tastes and fashions of the consumer. Dispersing and selling – The wholesaler keeps the goods in a warehouse. He sells them to the retailers who are often scattered over a large area. The retailers contact the wholesaler when goods are sold and this process continues over the years. The wholesaler thus helps in the dispersion process of marketing. Buys and sells goods in large quantities. Deals only in a few types of products. Acts as a middleman between the producers and retailers. Usually makes cash purchases and sells goods on credit to the retailers. Does not sell direct to the consumer. Operates in a particular area determined by the producer. Merchant Wholesalers – These wholesale suppliers own and produce a product or service and resell their products to resellers, retailers, distributors and other wholesalers. If you can buy the products you require direct from the supplier you will usually be able to obtain the best prices and profit margins. General Wholesalers – Wholesalers that fall into this category will usually buy large quantities of products from one or more suppliers and will be intending to add value to them by reselling in smaller quantities to distributors, retailers and resellers. This type of wholesale supplier will often have multiple suppliers adding diversity to their product range and choice for their customers. This type of wholesaler may resell products from a number of different industries and in several different categories. Speciality Wholesalers – This type of wholesaler will resell products in a specific industry or product category but may have products from multiple suppliers. Because speciality wholesalers specialise in a specific industry or product type they tend to have good product knowledge and good pricing. Specific Product Wholesalers – These are wholesalers who only supply one type of product for example footwear or computers. They may supply several brands but only within one product category. Manufacturers often use this type of wholesaler to distribute one or more of their products. Discount Wholesalers – This type of wholesaler will supply significantly discounted stock. Generally the stock is discounted because the products are discontinued lines, returned goods or refurbished goods. Drop Ship Wholesalers – This type of wholesaler will complete the sale of a product but will have it dispatched from their supplier directly to their customer without actually handling the goods. On-line Wholesaler – Wholesalers who sell their products on-line offer discounted prices as they can reduce their overheads such as rent and rates of physical premises. This type of wholesaler is therefore able to add a lower percentage to their purchase price and still make margin. The modern office of a wholesaler works on the principle of ‘Division of Labour’. Since wholesalers buy large quantities of goods, provide warehousing facilities and also perform a number of marketing and financial functions, they need a large amount of working capital to operate on a large scale. The wholesaler has to carry huge stocks for each traded commodity and as such has to maintain proper warehouses. They may also support the cost of external sales who will approach retailers and book orders for the wholesaler. They may also have to maintain a fleet of transport vehicles. Hence, the wholesale function involves a wide variety of financial and managerial considerations in order to carry on its importance in promotion of trade and commerce. The formulation of plans and policies is made by the top level management while the day-to-day business is carried on by the functional managers (refer to chart). Therefore a wholesale business is either in the form of a partnership concern or a joint stock company. The success of the entire business depends on the efficient working of the Executive Department. Each department is placed under a departmental head, who in turn is answerable to the General Manager. The Cash Department is under the Head Cashier’s control, etc. Cost of acquisition issue in the 1980s. The advent of mini-frame UNIX based systems supporting mainframe type power and enhanced functionality drives development at application layer by the likes of Tetra and Pegasus systems. Their solution targeted at the accountant and the accountancy practice which ultimately became a major route to market for both. This level of solution really aimed at the larger end of the SME marketplace and was cost prohibitive for smaller business. Only with the advent of 20th century communications infrastructure investment/enhancement coupled with the rise of the Microsoft based PC as the ubiquitous and de-facto computing platform – the democratisation of computing – was the cost of a computer based business system driven down to an affordable level for the newer, smaller business. Even with these tectonic plates colliding the solutions available, especially for the rising small to medium sized wholesaler business were often single user or specific line-of-business orientated. Some of these, powerful and intuitive in their own right, only contributed to more and more ‘silos’ of specific data. The only difference being that the new ‘silos’ were digital as opposed to ‘housed’ in lever arch files, they still required complex management and external process/workflow to retrieve and collate in to any meaningful context to the thriving wholesaler. More importantly these point solutions contributed both cost (in terms of resource/salary to manage) and inefficiency in the business workflow. The advent of the internet and cloud based delivery moving to the Internet of Things (IoT) should have been the ultimate paradigm shift as this heralded a move to effectively renting ‘super computer’ capability and possibly more impactful a move from a Capital Expenditure purchase to an Operating Expenditure procurement exercise, easing entry to this capability for many smaller businesses. Yet still there are natural barriers to entry for the smaller wholesaler business. Inadequate communications in the ‘last mile’ as presented to your business/warehouse is one of these limiting factors – why would you rent a remote solution that you cannot access or can only access at ‘dial up’ speeds. There are also concerns about data privacy especially as they relate to sensitive business materials. Software for wholesalers will continue to develop, specifically by specialists who have a deep understanding of the complexities of wholesaling.